Advanced Google Search allows you to more precisely craft your policy searches. Often helpful advanced limits include "exact word or phrase," "site or domain," "last update." Language and many other specific limits are also possible from this page. When searching Google, synonyms for "policy" and the term "policy" itself should be used in combination with keywords that match your topic. Policy synonyms arguably include terms like "bill, law, legislation, proposal, white paper, policy brief, regulation, position paper, guideline, protocol, recommendation, rule, standard, etc." Publishers of policy do not typically bury their ideas behind pay walls, or publish in prohibitively expensive academic journals. Policy truly wants to be free (to mangle a phrase) and for that reason, Google becomes an especially effective policy discovery platform. Although its search algorithm (the "page rank" engine that drives the search) is effective for policy discovery, it is essential to remember that no single search platform is capable of searching all web content at once, certainly not Google. 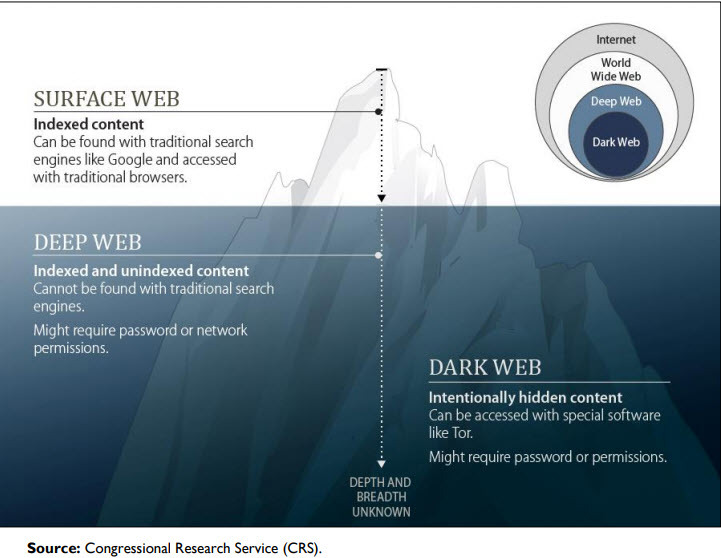 What you don't see is alot: Kristin Finklea, Congressional Research Service, R44101, DARK WEB (March 10 2017) at https://fas.org/sgp/crs/misc/R44101.pdf. Think tanks can be a great resource for research and statistics on a variety of topics, but think tanks are advocacy oriented. That a think tank refers to itself as non-partisan means that it has no formal connection to a political party, not that it doesn’t have an ideological orientation that may be more consistent with a given political party. The University of Oregon Libraries' American Policy Directory indexes think tanks and major policy making institutes by broad topic area: Animals & Wildlife | Business | Civil Rights | Constitutional Rights | Consumer Protection | Economic Rights | Education/Arts/Culture | Environmental | Families/Children/Elderly | Governmental Process | Health/Nutrition | Housing | Immigration | Information Policy | International Affairs | Labor | Land Use | Media | Public Finance/Taxation | Public Safety | Religion | Reproductive Issues | Science and Technology | Women's Issues. Fairness and Accuracy in Reporting categorizes the political leanings of 25 leading think tanks, and analyzes who is the most influential. A comprehensive report compiled by the Think Tanks and Civil Societies Program at the University of Pennsylvania -- the "think tanks' think tank." A curated Google search of more than 590 think tanks and research centers. Founded in 1916, Brookings' focuses on a wide variety of domestic and international issues. Founded in 1977, the Cato Institute is a public policy think tank dedicated to the principles of individual liberty, limited government, free markets and peace. Founded in 1991 the Milken Institute is an independent economic think tank that publishes research that apply market-based principles and financial innovations to a variety of societal issues in the US and internationally. This is a good first place to look for articles on any topic. Look for the option to limit your results by academic, magazine, or newspaper articles. You will need to use the VPN to access this resource from off campus. Each report analyzes a current social, political, and/or economic issue. Includes a pro/con section which presents different perspectives on the same topic. Covers topics related to education, including educational policy. Provides coverage of journal articles in political science, international relations, law, and public administration/policy. International in scope. Newspapers can be helpful sources of current information about new policies. Editorials and the Op-Ed pages are particularly good places to look, because they are spaces in which people write about problems and how they might be solved. The Newspaper Subject Guide provides access to many different newspapers, including international papers. A very large portal to global news (especially useful for current or emerging news stories). Access to the full text of the Los Angeles Times from 1986 to the present. The LA Times is not covered in the United States Newspapers database. Newspaper articles are a good way to keep up with current political, social, and economic issues. "Roll Call is a newspaper and website published in Washington, D.C., United States, when the United States Congress is in session. Roll Call reports news of legislative and political maneuverings on Capitol Hill, as well as political coverage of congressional elections across the country." "The Hill is an American political journalism newspaper and website published in Washington, D.C. since 1994. It is published by Capitol Hill Publishing, which is owned by News Communications, Inc."
"Welcome to the portal for Ballotpedia's coverage of state politics! Our state-level projects cover executive officials, legislative chambers, judiciaries, and ballot measures across the nation. We provide in-depth coverage because decisions made at the state level impact everything from what's taught in schools to household budgets. Our coverage of state politics is neutral, nonpartisan, and comprehensive, written in clear language for the non-specialist." The Legislative Analyst's Office has been providing fiscal and policy advice to the Legislature for more than 70 years. It is known for its fiscal and programmatic expertise and nonpartisan analyses of the state budget. The office serves as the "eyes and ears" for the Legislature to ensure that the executive branch is implementing legislative policy in a cost efficient and effective manner. The official legislative platform for California legislation including bills, laws and legislative publications for California. The California Research Bureau (CRB) within the California State Library provides nonpartisan, confidential research to the Governor's Office, members of both houses of the Legislature, and other state constitutional officers. Established in 1975, the "NCSL is committed to the success of all legislators and staff. 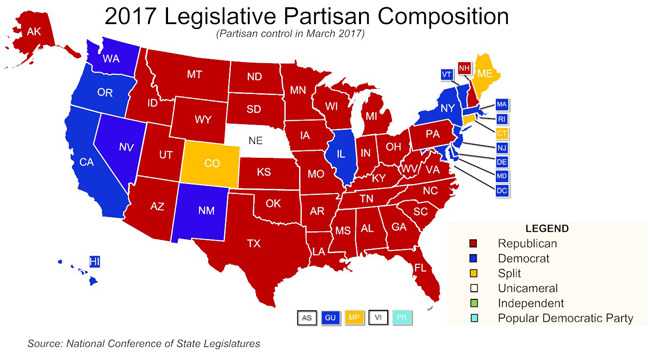 Our mission is to improve the quality and effectiveness of state legislatures, promote policy innovation and communication among state legislatures, ensure state legislatures a strong, cohesive voice in the federal system." Public Policy Institute of California (PPIC) - "Informing and improving public policy through independent, objective, nonpartisan research"
"The Public Policy Institute of California (PPIC) is a nonprofit, nonpartisan think tank dedicated to informing and improving public policy in California through independent, objective, nonpartisan research." Congress.gov provides legislative information from the House and Senate of the United States Congress. Use the links below to visit similar websites for the U.S. states and territories. "WashLaw Web provides users with links to law-related materials on the Internet. Generally speaking, the information is arranged alphabetically, by subject, and by geographic location. All links on WashLaw Web are maintained by staff members of the Washburn University School of Law Library." Provides legislative information from the Library of Congress. Here you'll find summaries and status of bills before Congress. You can also find the text and summaries of proposed legislation, as well the actions already taken on the policy. An independent website that makes it easy to look for bills before the current Congress. Another source for identifying proposed bills before Congress. This is a search engine for students, faculty, researchers, and officials who are doing research in intergovernmental organization topics. The IGO Search searches across hundreds of IGO websites, enabling users to research topics such as active IGOs working on HIV/AIDS in Uganda. "Ciao is designed to be a comprehensive source for theory and research in international affairs." A research guide from the University of Michigan. Includes links to European Union websites, documents and legislation. A research guide from the University of Michigan with information on UK (British) government and legislation. A research guide to International government documents and sites from Northwestern University. See resources by region, theme and country. Use the resources below to find raw statistics and make your own graphs and charts to show trends. You can also look in newspapers and databases to find graphs and charts created by others. "The U.S. Census Bureau terminated the collection of data for the Statistical Compendia program effective October 1, 2011." "The ProQuest Statistical Abstract of the United States is the authoritative and comprehensive summary of statistics on the social, political and economic conditions of the United States."